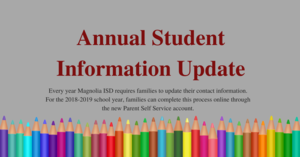 Magnolia ISD requires families to annually update their contact information and complete required district forms. For the 2018-19 school year, families can complete this process online through the new Parent Self-Serve account. 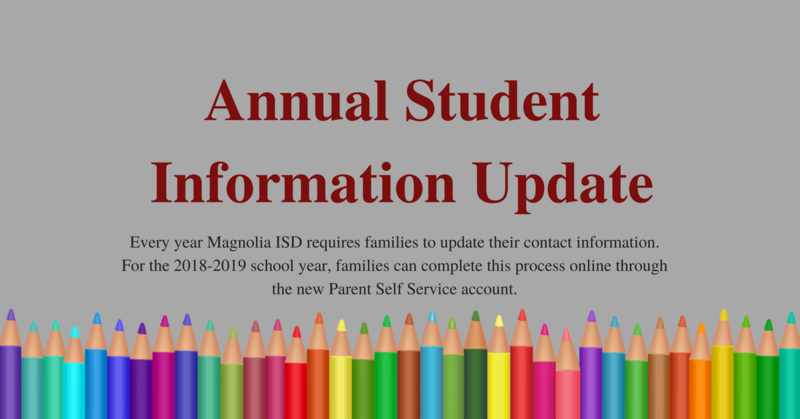 This year, the Annual Student Information Update will be completed by parents/guardians using their TEAMS – Parent Self-Serve account. This replaces the Enrollment Verification packet that was previously filled out at the MJH 7th Grade Mustang Stampede event. Parents/Guardians will need to create an account through Parent Self-Serve, as this system is replacing Home Access Center. To create your account, please click HERE.